Los Angeles County Undersheriff Paul Tanaka, the department’s second-in-command who came under fire by a commission investigating violence in county jails, announced his retirement Wednesday. 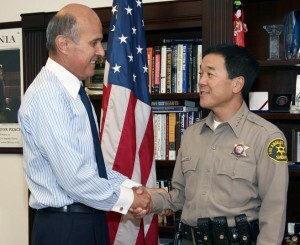 Sheriff Lee Baca named Paul Tanaka undersheriff in 2011. Tanaka, who has been with the department since 1982, starting his career as a custody deputy before moving on to Carson Station and patrol, will retire effective Aug. 1. According to the department, Tanaka is a certified public accountant who has managed the agency’s $2.5 billion budget for the past nine years as a chief, assistant sheriff, and undersheriff. Tanaka was criticized last year in a report by the Citizens’ Commission on Jail Violence, which was created to investigate allegations of abuse against inmates. The panel’s investigators found that Tanaka — as overseer of the jail system — not only failed to address concerns about violence against inmates by discouraging investigations into alleged deputy misconduct, but actually urged deputies to be aggressive against inmates. The investigators also faulted Sheriff Lee Baca, saying he failed to discipline Tanaka or other top managers despite admitting errors in judgment. Baca acknowledged that some deputies “have done some terrible things” in the jails, but he took issue with the panel’s characterizations of deputies running rampant in the jails. Baca said he would hire a new assistant sheriff to oversee the jails, and Tanaka’s role in recent months has primarily been to oversee the agency’s budget. In a statement announcing his retirement, the Sheriff’s Department said, “Mr. Tanaka developed a Department of Justice award-winning High-Impact Community-Based Policing Program that reduced crime by implementing public trust, problem-solving strategies. Also, he created and developed the Asian Crimes Task Force that apprehended criminals preying on the Asian community. In an editorial on Friday, The Los Angeles Times called Tanaka’s departure “welcome news” and said, “Few who have followed the upheaval in Sheriff Lee Baca’s department over the last couple of years can have forgotten Tanaka’s infamous statement to deputies encouraging them to work in the ‘gray area’ — language Tanaka insists was misinterpreted and not intended to imply that jailers should break the rules or use violence against inmates. The Times also raised questions about Tanaka’s involvement in the shipment of bullet-proof vests from the Sheriff’s Department to the government of Cambodia through the City of Gardena in 2002, when he was a city councilman and the sheriff’s chief of administrative services. Tanaka insists that the matter has been investigated repeatedly and nothing improper was found. The announcement of Tanaka’s retirement comes just one day after he won re-election to a third term as mayor of Gardena. Although he did not actively campaign, he easily beat Councilmember Rachel Johnson, 2,775 votes (58.6%) to 1,686 (35.6%). Councilmember Dan Medina, a write-in candidate, was a distant third with 272 (5.7%). But Tanaka’s troubles did not deter voters from returning him to office.